A delicious scent to celebrate the Winter Solstice, known by Pagans as Yule. The Winter Solstice marks the longest night and shortest day of the year. In northern climates, this is the darkest and coldest time of the year. Yule is still celebrated in Scandinavian countries. The word "yule" in old Norse means "wheel". The sun appears weak and it's as if winter will last forever. But as soon as the Solstice passes, the days will begin to grow longer as the Sun rises earlier and earlier, each time adding a little more of His light and warmth to the cold and silent days of winter. The Winter Solstice marks a dramatic point in the Wheel of the Year. The Sun symbolically dies and is reborn. On Yule, we honor the Goddess, Mother Earth, for giving birth to the Sun once more. This oil has been created to honor this point in the wheel of the year, to honor the Sun king and his Mother, and to honor family, friends and all we have been blessed with in the previous year. 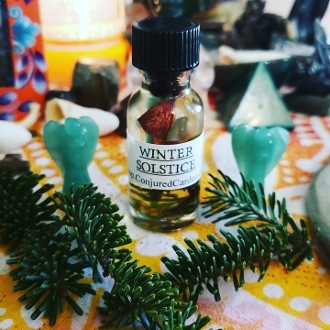 Make your Yule ritual one of a kind and bless your upcoming year with this pure, magickal blend. Use in an oil burner to fill your home with rich loving energy, use it to anoint each other at your next coven gathering, or slip some into your friends and families stockings. Created with oils of bayberry, cinnamon, vanilla, orange, pine, cedar, sandalwood, and frankincense. This oil is simply mouth watering and is suitable as an everyday perfume if you ask me;) thanks for looking!